Soft and pliable, Crayola Air-Dry modeling clay allows children to create solid, durable arts and crafts without the need for an oven or kiln. Smoother, finer, and less sticky than traditional clay, Air-Dry Clay softens easily with water and quickly cleans from hands and surfaces. It’s ideal for traditional techniques such as pinch, coil, slab, and score-and-weld, and for making stamped impressions, beads, and embedding found objects. When dry, pieces can be decorated with markers, acrylic paints, tempera, or watercolors. 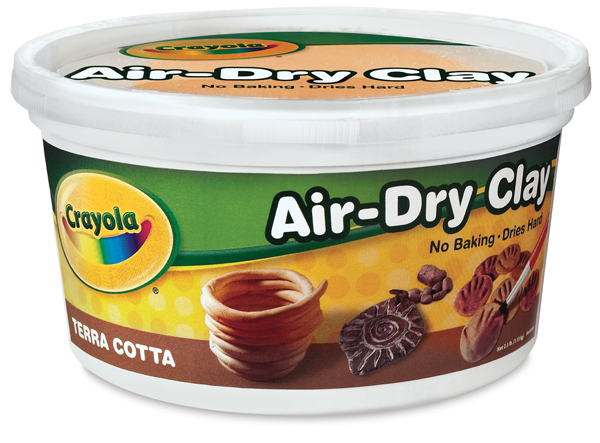 Crayola Air-Dry Clay is available in two colors and in 2½ lb and 5 lb reusable plastic buckets, or an economical 25 lb value pack. 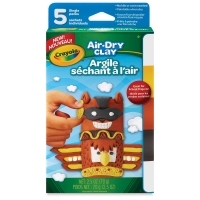 Variety Pack, Neutral Colors — This pack contains five 0.25 lb foil packs of Crayola Air-Dry Clay, including one each of Charcoal, Terra Cotta, and Sunglow, and two White. 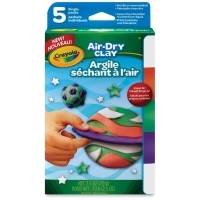 Variety Pack, Bright Colors — This pack contains five 0.25 lb foil packs of Crayola Air-Dry Clay, including one each of Coral, Emerald, and Violet, and two White. Note — Any combination of clay, plaster, sand, and molding material totaling 50 lbs or more does not qualify for our free shipping offer.